Avira anti-virus solution is one of the oldest free anti-virus in the market which gives your PC basic protection against malware like viruses, worms, trojans, rootkits, adware and spyware. It scans your system at a fine speed and if found infected, it repairs the system automatically by removing the problems of malware. It has simple and clean interface which is easy to understand and makes it even easier to use. The main interface is the Status window in itself which has a green check box that lets you know when you are safe. This check box turns yellow if there are security tasks to be performed and turns red if there is some critical problem. Below that box, there are two categorized columns: PC protection and Internet protection. PC protection protects you against local threats while Internet Protection protects you from new threats which can attack you. Awareness points for users while installation are that this is an ad supported application and offers to install non required software during installation. Improvements has been made in terms of stability and reliability. Resource usage has been decreased as compared to earlier version. IPv6 Support for the FireWall, Web and Mail Protection. Avira anti-virus has an effective antivirus solution that protects your computer against viruses, worms, trojans etc. It also features antidialer protection against expensive dialers. It follows the latest technology approach to scan for virus, worms and trojans. Once the scanning is done, it actively detects the type of malware and wait for your command to remove that or fix the problem before it infects your system. This antivirus basically gives you the basic protection of the system effectively but is not for avid computer users as some functions are missing in the free version. Rootkit is something that hides its presence or the presence of other applications like virus on your system for which it uses the lower application layer of your operating system. These malicious rootkits are very dangerous as it will not let you know if the virus or any spyware has infected your system. These rootkits can’t get detected by any simple anti-virus. 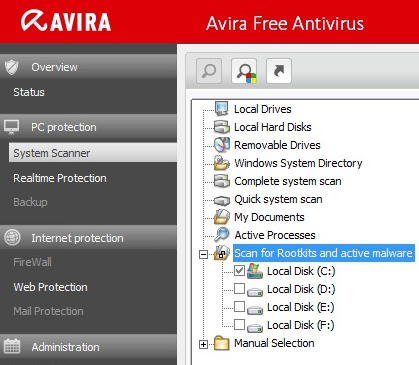 Avira anti-virus has inbuilt advanced anti rootkit component which scans for malicious rootkits hidden inside computer drivers or applications and doesn’t let any attacker to gain administrator level access to your computer. It scans, detects and removes malicious rootkits. Phishing is one particular way with which hackers or attackers will try to steal your identity. Protecting your identity on internet has become the major issue nowadays as people access their accounts and almost everything online. Anti-phishing component is basically an identity Protection component which is an application which senses if some fishy activity happens and prevent attackers from stealing your identity valuables like bank account details, passwords, credit card details etc. It monitors and automatically blocks the threats which may lead to steal your digital assets. Spyware is a malicious software that collects the information about users from their computers without their knowledge. Spyware is a deceptive software which doesn’t spread directly like a virus or a worm, instead it installs itself on the system pop-up advertisements or by monitoring web browsing activities. Like a spy, whenever it gets a chance, it enters your computer indirectly and gets self installed. Detection of spyware is very difficult as it stays hidden in the internal layers of computer. 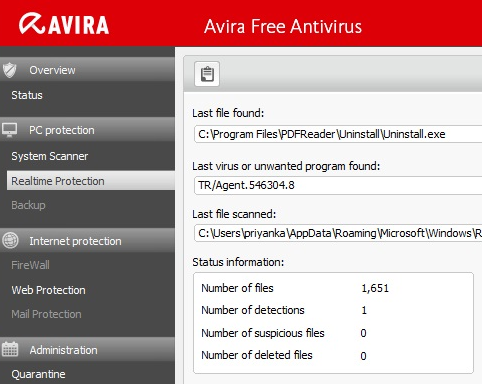 Avira antivirus can suspect such spywares and adwares and block them from entering into your computer. QuickRemoval eliminates the virus at the push of a button. It is also called one click threat removal as with this feature, you can remove any type of malware or threat with just a single click and that too very quickly. 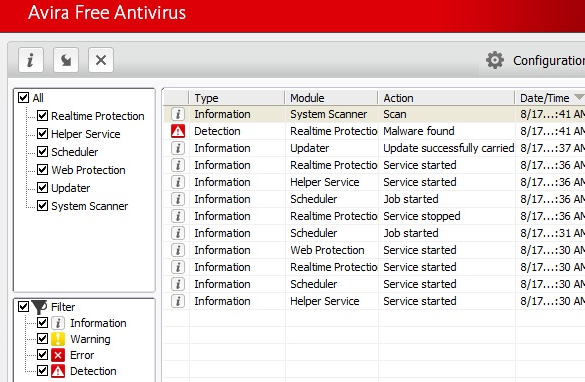 This feature includes four sub-parts like Quarantine which helps you to find the type of malware and when did it infect your system, Reports will tell you about the successful or unsuccessful scans and updates, Scheduler with which you can schedule your scans and Events which gives you the complete information of events that occurred in the system.